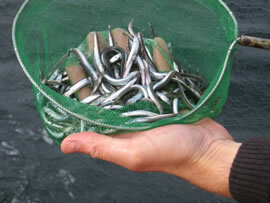 Sandeels are the main targeted prey of minke whales in northeast Scottish waters during the summer months. 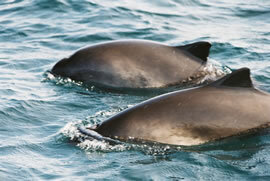 A pair of harbour porpoises. Measuring up to 1.8 metres in length, there are the smallest and most abundant of the cetacean species in European waters. Public whale rescue demonstrations are a great way to educate children and adults alike about the marine mammals on their doorstep and the threats they face. Common dolphins riding the bow of "Orca II". Recent studies have shown a northern range expansion of these neritic delphinids into the northern North Sea concurrent with increasing regional sea temperatures. In cooperation with universities, research institutions and other environmental organisations, current studies focus on the key coastal cetacean species frequenting the outer Moray Firth – namely the bottlenose dolphin, harbour porpoise and the minke whale – aiming to increase present knowledge of these marine mammals in these waters and provide robust scientific data for the adoption of management measures and effective conservation strategies for their future protection. For a comprehensive list of research publications by the CRRU research team, click HERE. 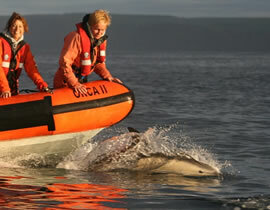 The CRRU has been involved in marine wildlife rescue since 1999, and operates the only 24 hr emergency veterinary response team of marine researchers specifically dedicated to assisting sick, injured and stranded cetaceans in Scotland. In excess of 600 individuals have been trained in marine mammal rescue over the past 10 years, and the veterinary team also works with other marine casualties such as seals, seabirds and turtles. For information on what to do if you find a stranded whale or dolphin, click HERE. Education is a key issue at the very core of the CRRU charity's ethos, and both the research and rescue activities of the group lend themselves (by way of materials, knowledge and experiences) to a rigorous educational outreach programme conducted throughout the year. This work takes many forms, from academic training and volunteering opportunities, to school visits and public talks, media work and the publication of educational materials and teaching resources. For further information on the CRRU's educational work, click HERE.